Browsing for posts tagged sugar snap peas. We’ve made this curry a couple of times and it’s quickly becoming one of our staples. 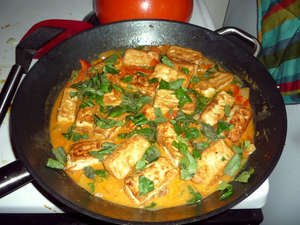 Really, the whole reason that this dish is amazing is the red curry paste from Thai Kitchen. Prior to using this, we relied on a hacky recipe involving squash soup and way too much curry powder. Much better now that we’re using the real deal. Now excellent curry just means mixing a spoonful of this red curry paste with a can of coconut milk, then throwing in our favorite in-season veggies. We really love the versatility of this recipe.